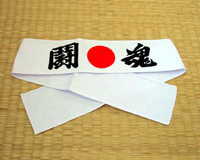 This hachimaki headband features a rising sun and the kanji for Toukon - made up from the Japanese characters meaning ’fight’ and ’spirit’ or ’soul’. Ideal for martial artists, athletes and demonstrators. Size: Width 6.5cm (2.5 inches) Length 94 cm (37 inches). Color: White background, red sun & black lettering. Japanese hachimaki are thin cotton strips tied around the forehead. Originally worn at festivals to ward off evil spirits, they also serve the purpose of keeping hair and perspiration out of the wearer’s eyes. Hachimaki also help the wearer to gather his/her spirits and show determination and resolve. The slight pressure around the forehead helps to improve concentration and speed of thought. They were worn by samurai under their helmets, kamikaze pilots during World War II, and commonly now by protesters attending demonstrations and by practitioners of martial arts.